Teaming up once again with our long standing collaborator Sammy Metcalfe (Cabaret Within, Man in the Elevator, Hamletmachine, You Are Invited), The Predictions brought our audience new theatrical implosions! Starting on 13th April 2012, exactly a year before the performance, Sammy submitted himself to a rigourous routine of writing one prediction about the world on 13th April 2013 every day. The 365 predictions was gathered and formed the basis of a durational show at Cafeteatret / Nordic Black Theatre in Oslo in which past and present collided and formed a fascinating world of conjecture, mapping out our shifting hopes and fears about the future. After sending us his daily predictions Sammy could forget about them. The next time he was faced with them was on 13th April 2013 when re-discovered all his predictions together with the audience during the course of the show. The show caught up with itself through time, starting with text written 365 days earlier and ending in the present. The very last prediction was written on stage at the beginning of the show, and read at the very end, posing the question: What prediction will the show end on? 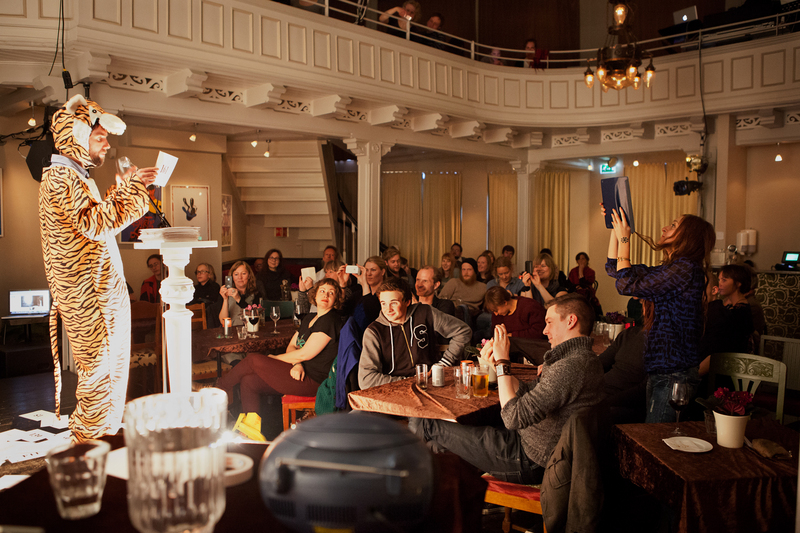 During the 3,5 hour event at Cafeteatret in Oslo, tea, coffee, wine and cake was served throughout the show, for a unique durational performance experience!